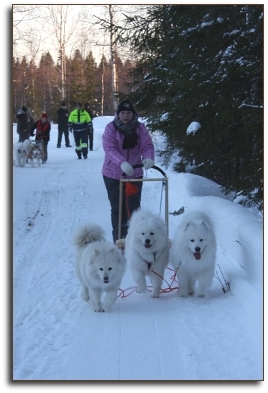 Sno'proof Samoyeds :: Going on? What's going on in kennel Sno'proof? Yet again this year new puppies, this time the proud father is our Lukas. While he was showing himself at the show nearby, her girlfriend gave birth to 8 puppies. Dam is Voga's Acabella, read and see more of the puppies at kennel Voga's homepages. Good luck continues! Because Lukas got the Estonian Champion few weeks earlier, he needed only one CAC from Finland to get the Fi Ch title. And the reserve-CACIB will turn to CACIB also! Almost naked Lukas made a surprise an got the CAC needed for the Estonian Champion title! He had also as a travel company Winter Day's Diamonds Are Forever, Sabi, very lovely and charming junior girl. No success for her, but still it was nice to have her with us, thank you for the owners!